Construction workers are seen expressing their objections to English on the construction site in March 2015. The FTQ construction union is demanding stricter enforcement and possibly strengthened legislation to compel builders to operate in French. 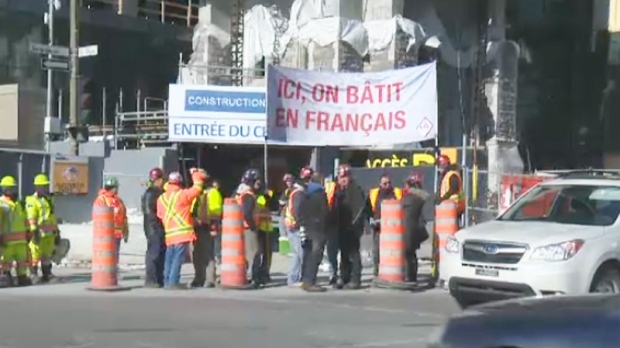 A handful of construction workers held a demonstration outside of the CHUM French superhospital Friday morning to complain that they have been receiving work-related documents in English and occasionally in Spanish. A union representative told a scrum of reporters that many other workers have the same grievance but choose not to come forward for fear of losing their jobs. The union reports that it has filed a complaint with the Office Quebecois de la Langue Francaise. The builders consortium said that it has satisfied OQLF guidelines and that the project has passed language inspections.